It was so great to gather with you all at our recent Fall Members Meeting! We believe it’s important to intentionally spend time together as a membership community and share about the things God is doing in and through Trinity. As always, if you were unable to attend or want to revisit any of the topics that were discussed, you can listen to each of the talks by clicking the links below. To open and setup the rest of the meeting, Kris McDaniel took time to remind us of Trinity’s commitment to uniting the charismatic, evangelical, and liturgical streams of the church into one unified expression of devotional and missional life. He spoke of the beauty, balance, and at times, tension that comes as a result of this commitment. To tend to life in the Holy Spirit, which awakens and stirs us. To turn outward toward others—we exist for those who are not yet here. To create hospitable spaces that help others enfold into the good thing that God is doing here at Trinity. Kris then challenged us to risk and hope that the LORD will help us embody these themes from Acts 2 here at Trinity, acknowledging that we’re beginners, but falling forward toward the goal. 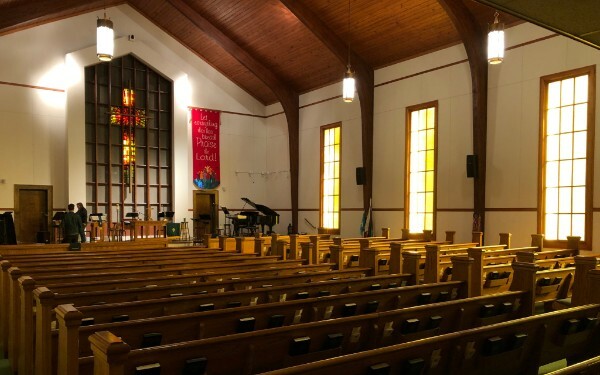 Following on from Kris, Marty Reardon shared what it looks like for Trinity to live into and engage a “three-streams” commitment particularly as it relates to Sunday worship on the Westside. Marty recalled that Paul encourages the church in Ephesians and Colossians to sing “psalms, hymns, and spiritual songs” as a way to connect our hearts and minds. We do this to get into the emotions of what we believe and to invite the Holy Spirit in to our lives. Marty also referenced two songs that were sung by Worship Fellows Sarah Bryan and Joel Norman as we began the evening, Reckless Love and Build My Life. Along with Marty’s talk you can listen to both songs below. Brad Mauldin spoke about the call to create warm and hospitable spaces here at Trinity on Sundays and beyond Sundays in our personal lives. He talked about how risk-taking is essential. We risk on Sundays to build credibility, and beyond Sundays to build equity. We believe that as the people of God, when a newcomer attends Trinity they should be experience warmth and hospitality unlike any other place. Listen as he gives examples of how we can live out this call collectively at Trinity and among the people we come into contact with outside the church. If you were moved by this call and are interested in joining a hospitality team, please don’t hesitate to reach out: WESTSIDE, EASTSIDE, or NORTHSIDE. The third theme from Acts 2 that the leadership team is focusing attention on right now is this idea of turning outward toward others. This means being vulnerable and opening ourselves up to both those that do not yet know the Lord, but also those that are different from ourselves in some way. Ashley Mathews spent time unpacking how we are leaning into this theme and what it means for Trinity going forward. She challenged us to engage in evangelism by both praying for those people in our lives that are not christians, as well as praying for specific opportunities to share our faith. Ashley also discussed our upcoming Alpha class launch and why it is so necessary to create spaces to engage others as a means of creating unity out of division. We heard from Matthew Browne with several updates on what God has been doing through the Eastside parish. He began by reminding us about the season of change that the Eastside has been through this last year, and how the Lord has been so faithful through it all. Matthew also shared how these themes from Acts 2 are being lived out on the Eastside. He talked about the various ways the Eastside is seeking to share the good news and to tangibly matter to the people of Oakhurst and surrounding neighborhoods. He also asked the church to be in prayer for guidance as the Eastside looks to add space or find a new meeting location so that we can make more room for people on the Eastside. Kris McDaniel interviewed Tripp Prince about the progress of the Northside launch. They were excited to announce that Trinity Northside is launching in just a few short weeks as an afternoon service (4pm), meeting in Brookhaven at Skyland United Methodist Church. We are incredibly excited about this new work. If you’re interested in learning more about this new parish, please listen to the talk below and consider joining us at one of the upcoming Info Meetings. To end the meeting, Matt Yoder gave us a few key updates on the financial health of Trinity. Matt showed us how the Lord has provided for our church time and time again as we’ve added services and spaces over the last 16 years.